Welcome to Casa Verardo’s Interactive Virtual Tour. 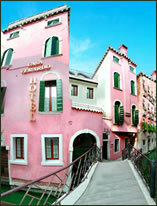 Click on the images below to begin a virtual wander around this charming and elegant 3 star Venice accommodation. The 360° photography is in high resolution so you can zoom in, zoom out and shake it all about. You can also see the tour in low resolution format if you have a slow connection speed. Can’t open the Virtual Tour? The tour runs using Java Runtime Environment. To down load this software free of charge, click on the icon below.